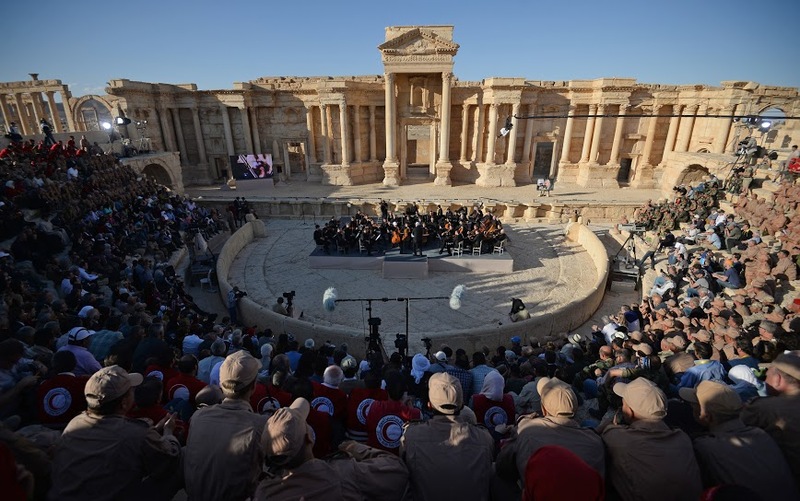 The Symphony Orchestra of the Mariinsky Theater gives a concert at the amphitheatre in Syria's Palmyra, May 5. The Symphony Orchestra of the Mariinsky Theater conducted by People's Artist of Russia Valery Gergiev gave a concert titled "With prayer about Palmyra. The music enlivens the ancient walls" at the world-famous amphitheatre in Syria's Palmyra on May 5. In particular, People's Artist of Russia cellist Sergei Roldugin performed Quadrille (from the opera 'Not Love Alone') by Rodion Shchedrin, Tchaikovsky Competition winner Pavel Milyukov played Chaconne (Ciaccona) by Johann Sebastian Bach. Russian President Vladimir Putin said during an address with Syria's city of Palmyra, that the concert of Mariinsky Theater Orchestra in the historic city is a gratitude to everyone fighting against terrorism.